Mandatory Palestine[a] (Arabic: فلسطين‎ Filasṭīn; Hebrew: פָּלֶשְׂתִּינָה (א"י) Pālēśtīnā (EY), where "EY" indicates "Eretz Yisrael", Land of Israel) was a geopolitical entity established between 1920 and 1923 in the Middle East roughly corresponding the region of Palestine, as part of the Partition of the Ottoman Empire under the terms of the British Mandate for Palestine. During the First World War (1914–18), an Arab uprising and the British Empire's Egyptian Expeditionary Force under General Edmund Allenby drove the Turks out of the Levant during the Sinai and Palestine Campaign. The United Kingdom had agreed in the McMahon–Hussein Correspondence that it would honour Arab independence if they revolted against the Ottomans, but the two sides had different interpretations of this agreement, and in the end, the UK and France divided up the area under the Sykes–Picot Agreement—an act of betrayal in the eyes of the Arabs. Further complicating the issue was the Balfour Declaration of 1917, promising British support for a Jewish "national home" in Palestine. At the war's end the British and French set up a joint "Occupied Enemy Territory Administration" in what had been Ottoman Syria. The British achieved legitimacy for their continued control by obtaining a mandate from the League of Nations in June 1922. The formal objective of the League of Nations mandate system was to administer parts of the defunct Ottoman Empire, which had been in control of the Middle East since the 16th century, "until such time as they are able to stand alone." The civil Mandate administration was formalized with the League of Nations' consent in 1923 under the British Mandate for Palestine, which covered two administrative areas. Following its occupation by British troops in 1917–1918, Palestine was governed by the Occupied Enemy Territory Administration. In July 1920 a civilian administration headed by a High Commissioner replaced the military administration. 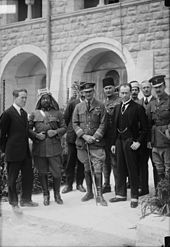 The first High Commissioner, Herbert Samuel, a Zionist and a recent British cabinet minister, arrived in Palestine on 20 June 1920 to take up his appointment from 1 July. Following the arrival of the British, the inhabitants established Muslim-Christian Associations in all the major towns. In 1919 they joined to hold the first Palestine Arab Congress in Jerusalem. Its aimed primarily at representative government and opposition to the Balfour Declaration. At the First World Congress of Jewish Women which was held in Vienna, Austria, 1923, it was decided that: "It appears, therefore, to be the duty of all Jews to co-operate in the social-economic reconstruction of Palestine and to assist in the settlement of Jews in that country." The Zionist Commission formed in March 1918 and became active in promoting Zionist objectives in Palestine. 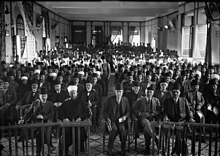 On 19 April 1920, elections took place for the Assembly of Representatives of the Palestinian Jewish community. The Zionist Commission received official recognition in 1922 as representative of the Palestinian Jewish community. One of the first actions of the newly installed civil administration in 1921 had been to grant Pinhas Rutenberg—a Jewish entrepreneur—concessions for the production and distribution of electrical power. Rutenberg soon established an electric company whose shareholders were Zionist organisations, investors, and philanthropists. Palestinian-Arabs saw it as proof that the British intended to favour Zionism. The British administration claimed that electrification would enhance the economic development of the country as a whole, while at the same time securing their commitment to facilitate a Jewish National Home through economic—rather than political—means. Samuel tried to establish self-governing institutions in Palestine, as required by the mandate, but the Arab leadership refused to co-operate with any institution which included Jewish participation. When Grand Mufti of Jerusalem Kamil al-Husayni died in March 1921, High Commissioner Samuel appointed his half-brother Mohammad Amin al-Husseini to the position. Amin al-Husseini, a member of the al-Husayni clan of Jerusalem, was an Arab nationalist and Muslim leader. As Grand Mufti, as well as in the other influential positions that he held during this period, al-Husseini played a key role in violent opposition to Zionism. In 1922, al-Husseini was elected President of the Supreme Muslim Council which had been established by Samuel in December 1921. The Council controlled the Waqf funds, worth annually tens of thousands of pounds and the orphan funds, worth annually about £50,000, as compared to the £600,000 in the Jewish Agency's annual budget. In addition, he controlled the Islamic courts in Palestine. Among other functions, these courts had the power to appoint teachers and preachers. The 1922 Palestine Order in Council established a Legislative Council, which was to consist of 23 members: 12 elected, 10 appointed, and the High Commissioner. Of the 12 elected members, eight were to be Muslim Arabs, two Christian Arabs, and two Jews. Arabs protested against the distribution of the seats, arguing that as they constituted 88% of the population, having only 43% of the seats was unfair. Elections took place in February and March 1923, but due to an Arab boycott, the results were annulled and a 12-member Advisory Council was established. In October 1923, Britain provided the League of Nations with a report on the administration of Palestine for the period 1920–1922, which covered the period before the mandate. In 1930, Sheikh Izz ad-Din al-Qassam arrived in Palestine from Syria and organised and established the Black Hand, an anti-Zionist and anti-British militant organisation. He recruited and arranged military training for peasants and by 1935 he had enlisted between 200 and 800 men. The cells were equipped with bombs and firearms, which they used to kill Zionist settlers in the area, as well as engaging in a campaign of vandalism of the settlers-planted trees and British constructed rail-lines. In November 1935, two of his men engaged in a firefight with a Palestine police patrol hunting fruit thieves and a policeman was killed. Following the incident, British police launched a manhunt and surrounded al-Qassam in a cave near Ya'bad. In the ensuing battle, al-Qassam was killed. During the first stages of the Arab Revolt, due to rivalry between the clans of al-Husseini and Nashashibi among the Palestinian Arabs, Raghib Nashashibi was forced to flee to Egypt after several assassination attempts ordered by Amin al-Husseini. Following the Arab rejection of the Peel Commission recommendation, the revolt resumed in autumn of 1937. Over the next 18 months, the British lost control of Nablus and Hebron. British forces, supported by 6,000 armed Jewish auxiliary police, suppressed the widespread riots with overwhelming force. The British officer Charles Orde Wingate (who supported a Zionist revival for religious reasons) organised Special Night Squads composed of British soldiers and Jewish volunteers such as Yigal Alon, which “scored significant successes against the Arab rebels in the lower Galilee and in the Jezreel valley”(Black 1991, p. 14) by conducting raids on Arab villages. (Shapira 1992, pp. 247, 249, 350) The Jewish militia Irgun used violence also against Arab civilians as "retaliatory acts", attacking marketplaces and buses. By the time the revolt concluded in March 1939, more than 5,000 Arabs, 400 Jews, and 200 British had been killed and at least 15,000 Arabs were wounded. The Revolt resulted in the deaths of 5,000 Palestinian Arabs and the wounding of 10,000. In total, 10% of the adult Arab male population was killed, wounded, imprisoned, or exiled. (Khalidi 2001, p. 26) From 1936 to 1945, while establishing collaborative security arrangements with the Jewish Agency, the British confiscated 13,200 firearms from Arabs and 521 weapons from Jews. The revolt had a negative effect on Palestinian Arab leadership, social cohesion, and military capabilities and contributed to the outcome of the 1948 War because "when the Palestinians faced their most fateful challenge in 1947–49, they were still suffering from the British repression of 1936–39, and were in effect without a unified leadership. Indeed, it might be argued that they were virtually without any leadership at all". In 1937, the Peel Commission proposed a partition between a small Jewish state, whose Arab population would have to be transferred, and an Arab state to be attached to Jordan. The proposal was rejected outright by the Arabs. The two main Jewish leaders, Chaim Weizmann and David Ben-Gurion, had convinced the Zionist Congress to approve equivocally the Peel recommendations as a basis for more negotiation. In a letter to his son in October 1937, Ben-Gurion explained that partition would be a first step to "possession of the land as a whole". The same sentiment was recorded by Ben-Gurion on other occasions, such as at a meeting of the Jewish Agency executive in June 1938, as well as by Chaim Weizmann. Following the London Conference (1939) the British Government published a White Paper which proposed a limit to Jewish immigration from Europe, restrictions on Jewish land purchases, and a program for creating an independent state to replace the Mandate within ten years. This was seen by the Yishuv as betrayal of the mandatory terms, especially in light of the increasing persecution of Jews in Europe. In response, Zionists organised Aliyah Bet, a program of illegal immigration into Palestine. Lehi, a small group of extremist Zionists, staged armed attacks on British authorities in Palestine. However, the Jewish Agency, which represented the mainstream Zionist leadership, still hoped to persuade Britain to allow resumed Jewish immigration, and cooperated with Britain in World War II. On 10 June 1940, Italy declared war on the British Commonwealth and sided with Germany. Within a month, the Italians attacked Palestine from the air, bombing Tel Aviv and Haifa, inflicting multiple casualties. In 1942, there was a period of great concern for the Yishuv, when the forces of German General Erwin Rommel advanced east across North Africa towards the Suez Canal and there was fear that they would conquer Palestine. This period was referred to as the "200 days of dread". This event was the direct cause for the founding, with British support, of the Palmach – a highly trained regular unit belonging to Haganah (a paramilitary group which was mostly made up of reserve troops). The Mufti al-Husseini would spend the rest of the war in Nazi Germany and the occupied areas in Europe. Besides Jews and Arabs from Palestine, in total by mid-1944 the British had assembled a multiethnic force consisting of volunteer European Jewish refugees (from German-occupied countries), Yemenite Jews and Abyssinian Jews. In 1939, as a consequence of the White Paper of 1939, the British reduced the number of immigrants allowed into Palestine. World War II and the Holocaust started shortly thereafter and once the 15,000 annual quota was exceeded, Jews fleeing Nazi persecution were interned in detention camps or deported to places such as Mauritius. Starting in 1939, a clandestine immigration effort called Aliya Bet was spearheaded by an organisation called Mossad LeAliyah Bet. Tens of thousands of European Jews escaped the Nazis in boats and small ships headed for Palestine. The Royal Navy intercepted many of the vessels; others were unseaworthy and were wrecked; a Haganah bomb sunk the SS Patria, killing 267 people; two more were sunk by Soviet submarines. The motor schooner Struma was torpedoed and sunk in the Black Sea by a Soviet submarine in February 1942 with the loss of nearly 800 lives. The last refugee boats to try to reach Palestine during the war were the Bulbul, Mefküre and Morina in August 1944. A Soviet submarine sank the motor schooner Mefküre by torpedo and shellfire and machine-gunned survivors in the water, killing between 300 and 400 refugees. Illegal immigration resumed after World War II. 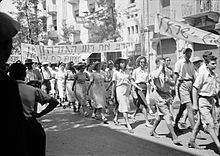 The Jewish Lehi (Fighters for the Freedom of Israel) and Irgun (National Military Organisation) movements initiated violent uprisings against the British Mandate in 1940s. On 6 November 1944, Eliyahu Hakim and Eliyahu Bet Zuri (members of Lehi) assassinated Lord Moyne in Cairo. Moyne was the British Minister of State for the Middle East and the assassination is said by some to have turned British Prime Minister Winston Churchill against the Zionist cause. After the assassination of Lord Moyne, the Haganah kidnapped, interrogated, and turned over to the British many members of the Irgun ("The Hunting Season"), and the Jewish Agency Executive decided on a series of measures against "terrorist organisations" in Palestine. Irgun ordered its members not to resist or retaliate with violence, so as to prevent a civil war. The negative publicity resulting from the situation in Palestine caused the Mandate to become widely unpopular in Britain, and caused the United States Congress to delay granting the British vital loans for reconstruction. The British Labour party had promised before its election in 1945 to allow mass Jewish migration into Palestine but reneged on this promise once in office. Anti-British Jewish militancy increased and the situation required the presence of over 100,000 British troops in the country. Following the Acre Prison Break and the retaliatory hanging of British Sergeants by the Irgun, the British announced their desire to terminate the mandate and to withdraw by no later than the beginning of August 1948. The Anglo-American Committee of Inquiry in 1946 was a joint attempt by Britain and the United States to agree on a policy regarding the admission of Jews to Palestine. In April, the Committee reported that its members had arrived at a unanimous decision. The Committee approved the American recommendation of the immediate acceptance of 100,000 Jewish refugees from Europe into Palestine. It also recommended that there be no Arab, and no Jewish State. The Committee stated that "in order to dispose, once and for all, of the exclusive claims of Jews and Arabs to Palestine, we regard it as essential that a clear statement of principle should be made that Jew shall not dominate Arab and Arab shall not dominate Jew in Palestine." U.S. President Harry S Truman angered the British Government by issuing a statement supporting the 100,000 refugees but refusing to acknowledge the rest of the committee's findings. Britain had asked for U.S assistance in implementing the recommendations. 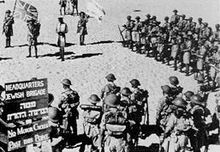 The U.S. War Department had said earlier that to assist Britain in maintaining order against an Arab revolt, an open-ended U.S. commitment of 300,000 troops would be necessary. The immediate admission of 100,000 new Jewish immigrants would almost certainly have provoked an Arab uprising. On 29 November 1947, the UN General Assembly, voting 33 to 13, with 10 abstentions, adopted a resolution recommending the adoption and implementation of the Plan of Partition with Economic Union as Resolution 181 (II)., while making some adjustments to the boundaries between the two states proposed by it. The division was to take effect on the date of British withdrawal. The partition plan required that the proposed states grant full civil rights to all people within their borders, regardless of race, religion or gender. The UN General Assembly is only granted the power to make recommendations, therefore, UNGAR 181 was not legally binding. Both the U.S. and the Soviet Union supported the resolution. Haiti, Liberia, and the Philippines changed their votes at the last moment after concerted pressure from the U.S. and from Zionist organisations. The five members of the Arab League, who were voting members at the time, voted against the Plan. The partition plan was rejected out of hand by Palestinian Arab leadership and by most of the Arab population. [qt 1][qt 2] Meeting in Cairo on November and December 1947, the Arab League then adopted a series of resolutions endorsing a military solution to the conflict. Britain announced that it would accept the partition plan, but refused to enforce it, arguing it was not accepted by the Arabs. Britain also refused to share the administration of Palestine with the UN Palestine Commission during the transitional period. In September 1947, the British government announced that the Mandate for Palestine would end at midnight on 14 May 1948. Some Jewish organisations also opposed the proposal. Irgun leader Menachem Begin announced, "The partition of the Homeland is illegal. It will never be recognised. The signature by institutions and individuals of the partition agreement is invalid. It will not bind the Jewish people. Jerusalem was and will forever be our capital. Eretz Israel will be restored to the people of Israel. All of it. And for ever." These views were publicly rejected by the majority of the nascent Jewish state. When the UK announced the independence of Transjordan in 1946, the final Assembly of the League of Nations and the General Assembly both adopted resolutions welcoming the news. The Jewish Agency objected, claiming that Transjordan was an integral part of Palestine, and that according to Article 80 of the UN Charter, the Jewish people had a secured interest in its territory. During the General Assembly deliberations on Palestine, there were suggestions that it would be desirable to incorporate part of Transjordan's territory into the proposed Jewish state. A few days before the adoption of Resolution 181 (II) on 29 November 1947, U.S. Secretary of State Marshall noted frequent references had been made by the Ad Hoc Committee regarding the desirability of the Jewish State having both the Negev and an "outlet to the Red Sea and the Port of Aqaba." According to John Snetsinger, Chaim Weizmann visited President Truman on 19 November 1947 and said it was imperative that the Negev and Port of Aqaba be under Jewish control and that they be included in the Jewish state. Truman telephoned the US delegation to the UN and told them he supported Weizmann's position. However, the Trans-Jordan memorandum excluded territories of the Emirate of Transjordan from any Jewish settlement. Immediately after the UN resolution, the 1947-1948 Civil War in Mandatory Palestine broke out between the Arab and Jewish communities, and British authority began to break down. On 16 December 1947, the Palestine Police Force withdrew from the Tel Aviv area, home to more than half the Jewish population, and turned over responsibility for the maintenance of law and order to Jewish police. As the civil war raged on, British military forces gradually withdrew from Palestine, although they occasionally intervened in favour of either side. As they withdrew, they handed over control to local authorities and locally raised police forces were charged with maintaining law and order. The areas they withdrew from often quickly became war zones. The British maintained strong presences in Jerusalem and Haifa, even as Jerusalem came under siege by Arab forces and became the scene of fierce fighting, though the British occasionally intervened in the fighting, largely to secure their evacuation routes, including by proclaiming martial law and enforcing truces. The Palestine Police Force was largely inoperative, and government services such as social welfare, control of water supplies, and postal services were withdrawn. 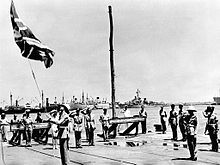 In April 1948, the British withdrew from most of Haifa but retained an enclave in the port area to be used in the evacuation of British forces, and temporarily retained RAF Ramat David airbase to cover their retreat, leaving behind a volunteer police force to maintain order. The city was quickly captured by the Haganah in the Battle of Haifa. Following the victory, British forces in Jerusalem announced that they had no intention of assuming control of any local administrations, but would not permit any actions that would hamper the safe and orderly withdrawal of British forces from Palestine, and would set up military courts to try persons who interfered. Although by this time British authority in most of Palestine had broken down, with most of the country in control of the Jews and Arabs, the British air and sea blockade of Palestine remained firmly in place. The British had notified the U.N. of their intent to terminate the mandate not later than 1 August 1948. However, early in 1948, the United Kingdom announced its firm intention to end its mandate in Palestine on 14 May. In response, President Harry S Truman made a statement on 25 March proposing UN trusteeship rather than partition, stating that "unfortunately, it has become clear that the partition plan cannot be carried out at this time by peaceful means... unless emergency action is taken, there will be no public authority in Palestine on that date capable of preserving law and order. Violence and bloodshed will descend upon the Holy Land. Large-scale fighting among the people of that country will be the inevitable result." By 14 May 1948, the only British forces remaining in Palestine were in the Haifa area and in Jerusalem. On that same day, the British garrison in Jerusalem withdrew, and High Commissioner Alan Cunningham left the city for Haifa, where he was to leave the country by sea. The Jewish Leadership, led by future Prime Minister, David Ben-Gurion, declared the establishment of a Jewish State in Eretz-Israel, to be known as the State of Israel, on the afternoon of 14 May 1948 (5 Iyar 5708 in the Hebrew calendar), to come into force at midnight of that day. On the same day, the Provisional Government of Israel asked the US Government for recognition, on the frontiers specified in the UN Plan for Partition. The United States immediately replied, recognizing "the provisional government as the de facto authority." On 15 May 1948, the Palestine Mandate ended and the State of Israel came into being. The Palestine Government formally ceased to exist, the status of British forces still in the process of withdrawal from Haifa changed to occupiers of foreign territory, the Palestine Police Force formally stood down and was disbanded, with the remaining personnel evacuated alongside British military forces, the British blockade of Palestine was lifted, and all Mandatory Palestine passports ceased to give British protection. The 1948 Palestinian exodus occurred in the period leading up to the end of the Mandate and subsequently. Over the next few days, approximately 700 Lebanese, 1,876 Syrian, 4,000 Iraqi, 2,800 Egyptian troops crossed over the borders and into Palestine. Around 4,500 Transjordanian troops, commanded partly by 38 British officers who had resigned their commissions in the British army only weeks earlier, including overall commander, General John Bagot Glubb, entered the Corpus separatum region encompassing Jerusalem and its environs (in response to the Haganah's Operation Kilshon) and moved into areas designated as part of the Arab state by the UN partition plan.
" Palestine" is shown in English, Arabic ( فلسطين) and Hebrew; the latter includes the acronym א״י for Eretz Yisrael (Land of Israel). The name given to the Mandate's territory was "Palestine", in accordance with European traditions. The term Palestine was coined in the Western culture from the name of Palaestina province of the Roman (Syria-Palaestina) and later Byzantine Empire (Palaestina Prima and Palaestina Secunda). The Mandate charter stipulated that Mandatory Palestine would have three official languages, namely English, Arabic and Hebrew. Colonel Symes explained that the country was described as "Palestine" by Europeans and as "Falestin" by the Arabs. The Hebrew name for the country was the designation "Land of Israel", and the Government, to meet Jewish wishes, had agreed that the word "Palestine" in Hebrew characters should be followed in all official documents by the initials which stood for that designation. As a set-off to this, certain of the Arab politicians suggested that the country should be called "Southern Syria" in order to emphasise its close relation with another Arab State. The resolution of the San Remo Conference contained a safeguarding clause for the existing rights of the non-Jewish communities. The conference accepted the terms of the Mandate with reference to Palestine, on the understanding that there was inserted in the memorandum a legal undertaking by the Mandatory Power that it would not involve the surrender of the rights hitherto enjoyed by the non-Jewish communities in Palestine. The draft mandates for Mesopotamia and Palestine, and all of the post-war peace treaties contained clauses for the protection of religious groups and minorities. The mandates invoked the compulsory jurisdiction of the Permanent Court of International Justice in the event of any disputes. Article 62 (LXII) of the Treaty of Berlin, 13 July 1878 dealt with religious freedom and civil and political rights in all parts of the Ottoman Empire. The guarantees have frequently been referred to as "religious rights" or "minority rights". However, the guarantees included a prohibition against discrimination in civil and political matters. Difference of religion could not be alleged against any person as a ground for exclusion or incapacity in matters relating to the enjoyment of civil or political rights, admission to public employments, functions, and honours, or the exercise of the various professions and industries, "in any locality whatsoever." A legal analysis performed by the International Court of Justice noted that the Covenant of the League of Nations had provisionally recognised the communities of Palestine as independent nations. The mandate simply marked a transitory period, with the aim and object of leading the mandated territory to become an independent self-governing State. Judge Higgins explained that the Palestinian people are entitled to their territory, to exercise self-determination, and to have their own State." The Court said that specific guarantees regarding freedom of movement and access to the Holy Sites contained in the Treaty of Berlin (1878) had been preserved under the terms of the Palestine Mandate and a chapter of the United Nations Partition Plan for Palestine. According to historian Rashid Khalidi, the mandate ignored the political rights of the Arabs. The Arab leadership repeatedly pressed the British to grant them national and political rights, such as representative government, over Jewish national and political rights in the remaining 23% of the Mandate of Palestine which the British had set aside for a Jewish homeland. The Arabs reminded the British of President Wilson's Fourteen Points and British promises during the First World War. The British however made acceptance of the terms of the mandate a precondition for any change in the constitutional position of the Arabs. A legislative council was proposed in The Palestine Order in Council, of 1922 which implemented the terms of the mandate. It stated that: "No Ordinance shall be passed which shall be in any way repugnant to or inconsistent with the provisions of the Mandate." For the Arabs, this was unacceptable, as they felt that this would be "self murder". As a result, the Arabs boycotted the elections to the Council held in 1923, which were subsequently annulled. During the whole interwar period, the British, appealing to the terms of the mandate, which they had designed themselves, rejected the principle of majority rule or any other measure that would give an Arab majority control over the government of Palestine. The terms of the mandate required the establishment of self-governing institutions in both Palestine and Transjordan. In 1947, Foreign Secretary Bevin admitted that during the previous twenty-five years the British had done their best to further the legitimate aspirations of the Jewish communities without prejudicing the interests of the Arabs, but had failed to "secure the development of self-governing institutions" in accordance with the terms of the Mandate. The conquest of the Ottoman Syria by the British forces in 1917, found a mixed community in the region, with Palestine, the southern part of the Ottoman Syria, containing a mixed population of Muslims, Christians, Jews and Druze. In this period, the Jewish community (Yishuv) in Palestine was composed of traditional Jewish communities in cities (the Old Yishuv), which had existed for centuries, and the newly established agricultural Zionist communities (the New Yishuv), established since the 1870s. With the establishment of the Mandate, the Jewish community in Palestine formed the Zionist Commission to represent its interests. In 1929, the Jewish Agency for Palestine took over from the Zionist Commission its representative functions and administration of the Jewish community. During the Mandate period, the Jewish Agency was a quasi-governmental organisation that served the administrative needs of the Jewish community. Its leadership was elected by Jews from all over the world by proportional representation. The Jewish Agency was charged with facilitating Jewish immigration to Palestine, land purchase and planning the general policies of the Zionist leadership. It ran schools and hospitals, and formed the Haganah. The British authorities offered to create a similar Arab Agency but this offer was rejected by Arab leaders. During the Mandate, the Yishuv or Jewish community in Palestine, grew from one-sixth to almost one-third of the population. According to official records, 367,845 Jews and 33,304 non-Jews immigrated legally between 1920 and 1945. It was estimated that another 50–60,000 Jews and a marginal number of Arabs, the latter mostly on a seasonal basis, immigrated illegally during this period. Immigration accounted for most of the increase of Jewish population, while the non-Jewish population increase was largely natural. Of the Jewish immigrants, in 1939 most had come from Germany and Czechoslovakia, but in 1940–1944 most came from Romania and Poland, with an additional 3,530 immigrants arriving from Yemen during the same period. Article 7. The Administration of Palestine shall be responsible for enacting a nationality law. There shall be included in this law provisions framed so as to facilitate the acquisition of Palestinian citizenship by Jews who take up their permanent residence in Palestine. The United Nations Special Committee on Palestine said the Jewish National Home, which derived from the formulation of Zionist aspirations in the 1897 Basle program has provoked many discussions concerning its meaning, scope and legal character, especially since it had no known legal connotation and there are no precedents in international law for its interpretation. It was used in the Balfour Declaration and in the Mandate, both of which promised the establishment of a "Jewish National Home" without, however, defining its meaning. A statement on "British Policy in Palestine," issued on 3 June 1922 by the Colonial Office, placed a restrictive construction upon the Balfour Declaration. The statement included "the disappearance or subordination of the Arabic population, language or customs in Palestine" or "the imposition of Jewish nationality upon the inhabitants of Palestine as a whole", and made it clear that in the eyes of the mandatory Power, the Jewish National Home was to be founded in Palestine and not that Palestine as a whole was to be converted into a Jewish National Home. The Committee noted that the construction, which restricted considerably the scope of the National Home, was made prior to the confirmation of the Mandate by the Council of the League of Nations and was formally accepted at the time by the Executive of the Zionist Organisation. The League of Nations Permanent Mandates Commission took the position that the Mandate contained a dual obligation. In 1932 the Mandates Commission questioned the representative of the Mandatory on the demands made by the Arab population regarding the establishment of self-governing institutions, in accordance with various articles of the mandate, and in particular Article 2. The Chairman noted that "under the terms of the same article, the mandatory Power had long since set up the Jewish National Home." In 1937, the Peel Commission, a British Royal Commission headed by Earl Peel, proposed solving the Arab–Jewish conflict by partitioning Palestine into two states. The two main Jewish leaders, Chaim Weizmann and David Ben-Gurion, had convinced the Zionist Congress to approve equivocally the Peel recommendations as a basis for more negotiation. The US Consul General at Jerusalem told the State Department that the Mufti had refused the principle of partition and declined to consider it. The Consul said that the Emir Abdullah urged acceptance on the ground that realities must be faced, but wanted modification of the proposed boundaries and Arab administrations in the neutral enclave. The Consul also noted that Nashashibi sidestepped the principle, but was willing to negotiate for favourable modifications. A collection of private correspondence published by David Ben Gurion contained a letter written in 1937 which explained that he was in favour of partition because he didn't envision a partial Jewish state as the end of the process. Ben Gurion wrote "What we want is not that the country be united and whole, but that the united and whole country be Jewish." He explained that a first-class Jewish army would permit Zionists to settle in the rest of the country with or without the consent of the Arabs. Benny Morris said that both Chaim Weizmann and David Ben Gurion saw partition as a stepping stone to further expansion and the eventual takeover of the whole of Palestine. Former Israeli Foreign Minister and historian Schlomo Ben Ami writes that 1937 was the same year that the "Field Battalions" under Yitzhak Sadeh wrote the "Avner Plan", which anticipated and laid the groundwork for what would become in 1948, Plan D. It envisioned going far beyond any boundaries contained in the existing partition proposals and planned the conquest of the Galilee, the West Bank, and Jerusalem. In 1946 an Anglo-American Committee of Inquiry noted that the demand for a Jewish State went beyond the obligations of either the Balfour Declaration or the Mandate and had been expressly disowned by the Chairman of the Jewish Agency as recently as 1932. The Jewish Agency subsequently refused to accept the subsequent Morrison-Grady Plan as the basis for discussion. A spokesman for the agency, Eliahu Epstein, told the US State Department that the Agency could not attend the London conference if the Grady-Morrison proposal was on the agenda. He stated that the Agency was unwilling to be placed in a position where it might have to compromise between the Grady-Morrison proposals on the one hand and its own partition plan on the other. He stated that the Agency had accepted partition as the solution for Palestine which it favoured. As of 1931, the territory of the British Mandate of Palestine was 26,625,600 dunams (26,625.6 km2), of which 8,252,900 dunams (8,252.9 km2) or 33% were arable. Official statistics show that Jews privately and collectively owned 1,393,531 dunams (1,393.53 km2), or 5.23% of Palestine's total in 1945. The Jewish owned agricultural land was largely located in the Galilee and along the coastal plain. Estimates of the total volume of land that Jews had purchased by 15 May 1948 are complicated by illegal and unregistered land transfers, as well as by the lack of data on land concessions from the Palestine administration after 31 March 1936. According to Avneri, Jews held 1,850,000 dunams (1,850 km2) of land in 1947, or 6.94% of the total. Stein gives the estimate of 2,000,000 dunams (2,000 km2) as of May 1948, or 7.51% of the total. According to Fischbach, By 1948, Jews and Jewish companies owned 20% percent of all cultivable land in the country. Nevertheless, the amount of land owned by Jews is easier to calculate than that owned by Arabs. It is difficult to reckon the total amount of land owned by Arabs (Muslim, Christian and Druze) in Mandatory Palestine. The 1945 UN estimate shows that Arab ownership of arable land was on average 68% of a district, ranging from 15% ownership in the Beer-Sheba district to 99% ownership in the Ramallah district. These data cannot be fully understood without comparing them to those of neighbouring countries: in Iraq, for instance, still in 1951 only 0.3 per cent of registered land (or 50 per cent of the total amount) was categorised as ‘private property’. Data is from Survey of Palestine (vol. I, p. 245). 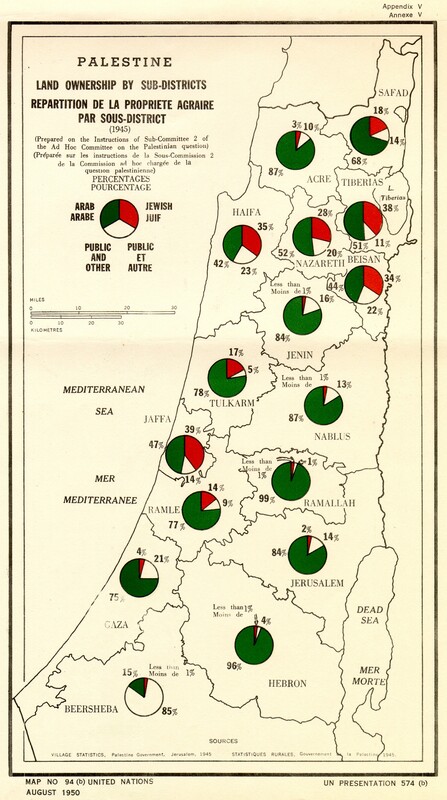 Data is from Survey of Palestine (vol. II, p. 566). By the end of 1946, Jewish ownership had increased to 1624 km2. In February 1940, the British Government of Palestine promulgated the Land Transfer Regulations which divided Palestine into three regions with different restrictions on land sales applying to each. In Zone "A", which included the hill-country of Judea as a whole, certain areas in the Jaffa sub-District, and in the Gaza District, and the northern part of the Beersheba sub-District, new agreements for sale of land other than to a Palestinian Arab were forbidden without the High Commissioner's permission. In Zone "B", which included the Jezreel Valley, eastern Galilee, a parcel of coastal plain south of Haifa, a region northeast of the Gaza District, and the southern part of the Beersheba sub-District, sale of land by a Palestinian Arab was forbidden except to a Palestinian Arab with similar exceptions. In the "free zone", which consisted of Haifa Bay, the coastal plain from Zikhron Ya'akov to Yibna, and the neighbohood of Jerusalem, there were no restrictions. The reason given for the regulations was that the Mandatory was required to "ensur[e] that the rights and positions of other sections of the population are not prejudiced," and an assertion that "such transfers of land must be restricted if Arab cultivators are to maintain their existing standard of life and a considerable landless Arab population is not soon to be created"
In 1920, the majority of the approximately 750,000 people in this multi-ethnic region were Arabic-speaking Muslims, including a Bedouin population (estimated at 103,331 at the time of the 1922 census and concentrated in the Beersheba area and the region south and east of it), as well as Jews (who comprised some 11% of the total) and smaller groups of Druze, Syrians, Sudanese, Somalis, Circassians, Egyptians, Copts, Greeks, and Hejazi Arabs. A discrepancy between the two censuses and records of births, deaths and immigration, led the authors of the second census to postulate the illegal immigration of about 9,000 Jews and 4,000 Arabs during the intervening years. There were no further censuses but statistics were maintained by counting births, deaths and migration. By the end of 1936 the total population was approximately 1,300,000, the Jews being estimated at 384,000. The Arabs had also increased their numbers rapidly, mainly as a result of the cessation of the military conscription imposed on the country by the Ottoman Empire, the campaign against malaria and a general improvement in health services. In absolute figures their increase exceeded that of the Jewish population, but proportionally, the latter had risen from 13 per cent of the total population at the census of 1922 to nearly 30 per cent at the end of 1936. Under the terms of the August 1922 Palestine Order in Council, the Mandate territory was divided into administrative regions known as districts and administer by the office of the British High Commissioner for Palestine. Between 1922 and 1947, the annual growth rate of the Jewish sector of the economy was 13.2%, mainly due to immigration and foreign capital, while that of the Arab was 6.5%. Per capita, these figures were 4.8% and 3.6% respectively. By 1936, the Jewish sector earned 2.6 times as much as Arabs. Compared to other Arab countries, the Palestinian Arab individuals earned slightly more. The Jaffa Electric Company was founded in 1923 by Pinhas Rutenberg, and was later absorbed into a newly created Palestine Electric Company. Palestine Airways was founded in 1934, Angel Bakeries in 1927, and the Tnuva dairy in 1926. Electric current mainly flowed to Jewish industry, following it to its nestled locations in Tel Aviv and Haifa. Although Tel Aviv had by far more workshops and factories, the demand for electric power for industry was roughly the same for both cities by the early 1930s. The country's largest industrial zone was in Haifa, where many housing projects were built for employees. On the scale of the UN Human Development Index determined for around 1939, of 36 countries, Palestinian Jews were placed 15th, Palestinian Arabs 30th, Egypt 33rd and Turkey 35th. The Jews in Palestine were mainly urban, 76.2% in 1942, while the Arabs were mainly rural, 68.3% in 1942. Overall, Khalidi concludes that Palestinian Arab society, while overmatched by the Yishuv, was as advanced as any other Arab society in the region and considerably more than several. 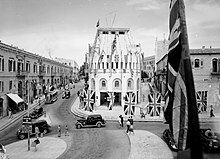 Under the British Mandate, the country developed economically and culturally. In 1919 the Jewish community founded a centralised Hebrew school system, and the following year established the Assembly of Representatives, the Jewish National Council and the Histadrut labour federation. The Technion university was founded in 1924, and the Hebrew University of Jerusalem in 1925. Literacy rates in 1932 were 86% for the Jews compared to 22% for the Palestinian Arabs, but Arab literacy rates steadily increased thereafter. Palestinian Arabs compared favourably in this respect to residents of Egypt and Turkey, but unfavourably to the Lebanese. ^ "League of Nations decision confirming the Principal Allied Powers' agreement on the territory of Palestine". Archived from the original on 2013-11-25. ^ "First Arab Congress 1919 Paris Resolution (in Arabic)" (PDF). ecf.org.il. ^ Las, Nelly. "International Council of Jewish Women". International Council of Jewish Women. Retrieved 20 November 2018. ^ Caplan, Neil. Palestine Jewry and the Arab Question, 1917 – 1925. London and Totowa, NJ: F. Cass, 1978. ISBN 0-7146-3110-8. pp. 148–161. ^ Mattar, Philip (2003). "al-Husayni, Amin". In Mattar, Philip (ed.). Encyclopedia of the Palestinians (Revised ed.). New York: Facts On File. ISBN 978-0-8160-5764-1. ^ Excluding funds for land purchases. Sahar Huneidi, A Broken Trust: Herbert Samuel, Zionism and the Palestinians 1920–1925, I.B. Tauris, London and New York, 2001 p. 38. The 'Jewish Agency', mentioned in article 4 of the Mandate only became the official term in 1928. At the time the organisation was called the Palestine Zionist Executive. ^ League of Nations, Official Journal, October 1923, p. 1217. ^ a b Segev, Tom (1999). One Palestine, Complete. Metropolitan Books. pp. 360–362. ISBN 978-0-8050-4848-3. ^ Smith, Charles D. (2007). Palestine and the Arab–Israeli Conflict: A History with Documents (Sixth ed.). pp. 111–225. ^ Gilbert 1998, p. 85: The Jewish Settlement Police were created and equipped with trucks and armoured cars by the British working with the Jewish Agency. ^ Reuven Firestone (2012). Holy War in Judaism: The Fall and Rise of a Controversial Idea. Oxford University Press. p. 192. ISBN 978-0-19-986030-2. ^ "Aljazeera: The history of Palestinian revolts". Archived from the original on December 15, 2005. Retrieved 2005-12-15. ^ a b Benny Morris, The Birth of the Palestinian Refugee Problem Revisited, p. 48; p. 11 "while the Zionist movement, after much agonising, accepted the principle of partition and the proposals as a basis for negotiation"; p. 49 "In the end, after bitter debate, the Congress equivocally approved—by a vote of 299 to 160—the Peel recommendations as a basis for further negotiation." ^ 'Zionists Ready To Negotiate British Plan As Basis', The Times Thursday, 12 August 1937; p. 10; Issue 47761; col B. ^ Eran, Oded. "Arab-Israel Peacemaking." The Continuum Political Encyclopedia of the Middle East. Ed. Avraham Sela. New York: Continuum, 2002, p. 122. ^ Secret World War II documents released by the UK in July 2001, include documents on Operation ATLAS (See References: KV 2/400–402. A German task force led by Kurt Wieland parachuted into Palestine in September 1944. This was one of the last German efforts in the region to attack the Jewish community in Palestine and undermine British rule by supplying local Arabs with cash, arms and sabotage equipment. The team was captured shortly after landing. ^ Lenk, RS (1994). The Mauritius Affair, The Boat People of 1940–41. London: R Lenk. ISBN 978-0951880524. ^ Aroni, Samuel (2002–2007). "Who Perished On The Struma And How Many?". JewishGen.org. ^ Подводная лодка "Щ-215". Черноморский Флот информационный ресурс (in Russian). 2000–2013. Retrieved 27 March 2013. ^ "מפקורה SS Mefküre Mafkura Mefkura". Haapalah / Aliyah Bet. 27 September 2011. Retrieved 26 March 2013. ^ "A/RES/181(II) of 29 November 1947". United Nations. 1947. Archived from the original on 24 May 2012. Retrieved 11 January 2012. ^ Roosevelt, Kermit (1948). "The Partition of Palestine: A lesson in pressure politics". Middle East Journal. 2 (1): 1–16. JSTOR 4321940. ^ Snetsinger, John (1974). Truman, the Jewish vote, and the creation of Israel. Hoover Institution. pp. 66–67. ^ Sarsar, Saliba (2004). "The question of Palestine and United States behavior at the United Nations". International Journal of Politics, Culture and Society. 17 (3): 457–470. doi:10.1023/B:IJPS.0000019613.01593.5e. ^ "Palestine". Encyclopædia Britannica Online School Edition, 2006. 15 May 2006. ^ Stefan Brooks (2008). "Palestine, British Mandate for". In Spencer C. Tucker (ed.). The Encyclopedia of the Arab-Israeli Conflict. 3. Santa Barbara, California: ABC-CLIO. p. 770. ISBN 978-1-85109-842-2. ^ A. J. Sherman (2001). Mandate Days: British Lives in Palestine, 1918–1948. The Johns Hopkins University Press. ISBN 978-0-8018-6620-3. ^ Menachem Begin (1977). "The Revolt". ^ See Mandates, Dependencies and Trusteeship, by H. Duncan Hall, Carnegie Endowment, 1948, pp. 266–267. ^ "The Mandate is Indivisble". Historical Jewish Press, Tel Aviv University, Palestine Post. 9 April 1946. p. 3. Archived from the original on 29 September 2010. ^ "The Near East and Africa". Foreign relations of the United States. 1947. p. 1255. ^ Snetsinger, John (1974). Truman, the Jewish vote, and the creation of Israel. Hoover Press. pp. 60–61. ISBN 978-0-8179-3391-3. ^ "The Near East and Africa, Volume V (1947)". United States Department of State, Foreign relations of the United States. p. 1271. ^ "Violence Ebbs; British Police Withdrawn from Tel Aviv and Its Environs - Jewish Telegraphic Agency". www.jta.org. ^ "British Forces in Jerusalem Alerter Following Haifa Victory; Fear Haganah Raid on City - Jewish Telegraphic Agency". www.jta.org. ^ a b "PALESTINE BILL (Hansard, 10 March 1948)". hansard.millbanksystems.com. ^ U.N. Resolution 181 (II). Future Government of Palestine, Part 1-A, Termination of Mandate, Partition and Independence Archived 2006-10-29 at the Wayback Machine. ^ "President Truman's Trusteeship Statement - 1948". www.mideastweb.org. ^ Declaration of the Establishment of the State of Israel, 14 May 1948. ^ J. Sussmann (1950). "Law and Judicial Practice in Israel". Journal of Comparative Legislation and International Law. 32: 29–31. ^ "Copy of telegram from Epstein to Shertok" (PDF). Government of Israel. Archived from the original (PDF) on 13 November 2013. Retrieved 3 May 2013. ^ "Our Documents - Press Release Announcing U.S. 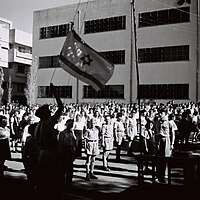 Recognition of Israel (1948)". www.ourdocuments.gov. ^ "Palestine Passports Cease to Give British Protection After May Govt. Announces - Jewish Telegraphic Agency". www.jta.org. ^ Masalha, Nur (1992). "Expulsion of the Palestinians." Institute for Palestine Studies, this edition 2001, p. 175. ^ Rashid Khalidi (September 1998). Palestinian identity: the construction of modern national consciousness. Columbia University Press. pp. 21–. ISBN 978-0-231-10515-6. Retrieved 22 January 2011. "In 1948 half of Palestine's… Arabs were uprooted from their homes and became refugees"
^ Khalidi, Edward Said Professor of Arab Studies Rashid; Khalidi, Rashid. Palestinian Identity: The Construction of Modern National Consciousness. ISBN 9780231527163. ^ Appendix IX-B, 'The Arab Expeditionary Forces to Palestine, 15/5/48, Khalidi, 1971, p. 867. ^ Bayliss, 1999, p. 84. ^ See Papers relating to the foreign relations of the United States "The Paris Peace Conference". 1919. p. 94. ^ League of Nations Union. "Summary of the work of the League of Nations, January 1920-March 1922". [London – via Internet Archive. ^ "Internet History Sourcebooks". www.fordham.edu. ^ "Filastin". National Library of Israel. Retrieved 4 March 2019. ^ Palestine Jewry and the Arab Question, 1917–1925, by Caplan, Neil. London and Totowa, NJ: F. Cass, 1978. ISBN 0-7146-3110-8. pp. 161–165. ^ A Survey of Palestine: Prepared in December 1945 and January 1946 for the Information of the Anglo-American Committee of Inquiry. 1. Palestine: Govt. printer. 1946. p. 185. ^ A Survey of Palestine: Prepared in December 1945 and January 1946 for the Information of the Anglo-American Committee of Inquiry. 1. Palestine: Govt. printer. 1946. p. 210: "Arab illegal immigration is mainly ... casual, temporary and seasonal". pp. 212: "The conclusion is that Arab illegal immigration for the purpose of permanent settlement is insignificant". ^ J. McCarthy (1995). The population of Palestine: population history and statistics of the late Ottoman period and the Mandate. Princeton, N.J.: Darwin Press. ^ John B. Quigley (2010). The Statehood of Palestine: International Law in the Middle East Conflict. Cambridge University Press. p. 54. ISBN 978-0-521-15165-8. ^ "The Avalon Project : The Palestine Mandate". avalon.law.yale.edu. ^ "PERMANENT MANDATES COMMISSION MINUTES OF THE TWENTY-SECOND SESSION". LEAGUE OF NATIONS. Archived from the original on 10 August 2011. Retrieved 8 June 2010. ^ "FRUS: Foreign relations of the United States diplomatic papers, 1937. The British Commonwealth, Europe, Near East and Africa: Palestine". digicoll.library.wisc.edu. ^ "Avalon Project - Anglo-American Committee of Inquiry - Chapter V". avalon.law.yale.edu. ^ Land Ownership of Palestine Archived 2008-10-29 at the Wayback Machine – Map prepared by the Government of Palestine on the instructions of the UN Ad Hoc Committee on the Palestine Question. ^ " "Hope Simpson report, Chapter III". Zionism-israel.com. October 1930. ^ Mills, E. Census of Palestine, 1931 (UK government, 1932), Vol I, pp. 61–65. ^ prepared in December 1945 and January 1946 for the information of the Anglo-American Committee of Inquiry. (1991). A Survey of Palestine: Prepared in December, 1945 and January, 1946 for the Information of the Anglo-American Committee of Inquiry. 1. Institute for Palestine Studies. pp. 12–13. ISBN 978-0-88728-211-9. ^ The Palestine Order in Council, 10 August 1922, article 11 Archived 16 September 2014 at the Wayback Machine: "The High Commissioner may, with the approval of a Secretary of State, by Proclamation divide Palestine into administrative divisions or districts in such manner and with such subdivisions as may be convenient for purposes of administration describing the boundaries thereof and assigning names thereto." ^ a b Likhovski, Assaf. Law and Identity in Mandate Palestine. p. 64. ^ "H.h. Trusted Named Chief Justice of Palestine". Jewish Telegraphic Agency. Retrieved 18 November 2015. ^ LikHovski, Assaf. Law and Identity in Mandate Palestine. p. 74. ^ LikHovski, Assaf. Law and Identity in Mandate Palestine. p. 75. ^ Shamir, Ronen (2013). Current Flow: The Electrification of Palestine. Stanford: Stanford University Press. ^ Noam Dvir (5 April 2012). "Haifa's glass house transparent, but still an Israeli mystery". Haaretz. ^ "The Jewish Community Under the Palestine Mandate". www.jewishvirtuallibrary.org. This page is based on the Wikipedia article Mandatory Palestine; it is used under the Creative Commons Attribution-ShareAlike 3.0 Unported License (CC-BY-SA). You may redistribute it, verbatim or modified, providing that you comply with the terms of the CC-BY-SA.